Lawyers for Limerick woman Ruth Morrissey, who is suing the HSE and two laboratories over the alleged misreading of cervical smears, have told the High Court that if she had known earlier about a review showing smear tests were reported incorrectly, the recurrence of her cancer could have been spotted sooner. Ms Morrissey told the court that if she had known earlier about the review showing two smear tests were reported incorrectly, she would have asked for more scans and better surveillance of her condition. The 37-year-old was diagnosed with cervical cancer in 2014 but was not told until May last year that a review in 2014 and 2015 showed two smears taken under the CervicalCheck screening programme in 2009 and 2012 were reported incorrectly. Her legal action resumed in the High Court today, where she told the court that if she had known about these smears in 2015 and 2016, she would "absolutely" have asked for more scans and better surveillance. If they had said no, she said she would have gone private. Her senior counsel, Jeremy Maher, said there was the opportunity to detect the recurrence of her tumour at an earlier stage. He said she would have had the probability of life rather than the probability of death. He said it was also their case that the number of cells on the slide examined in the 2012 smear test was inadequate. Mr Maher said they only became aware this month of a medical report which indicated that if the recurrence of Ms Morrissey's cancer had been identified in late 2015 or 2016, it would have been small and amenable to treatment including surgery. The court heard that Ms Morrissey has undergone 25 sessions of radiotherapy and chemotherapy since she was diagnosed with a recurrence of her cancer a year ago, and is suffering from chronic pain and fatigue. She has been told surgery is not possible. Mr Maher said she had also been diagnosed with breast cancer and had a double mastectomy last November. He said her prognosis would be excellent but for the cervical cancer. The court heard a letter from Ms Morrissey's treating consultant said her scans and an MRI this month showed disappointing results and there was a concern that the symptoms had returned. Mr Maher said her prognosis remained "very guarded". Ms Morrissey herself told the court it was "tough" at home, and with so much radiotherapy and chemotherapy they thought she had a chance of getting through. Her husband, Paul Morrissey, told the court it had been extremely tough for the family and it was like there was a dark cloud over them. He said it was like a bad dream you cannot wake up from. He said it seemed to be one thing after another and it was "heartbreaking, terrifying and unimaginable". The laboratories - Quest Diagnostics and Medlab Pathology - deny all the claims against them. 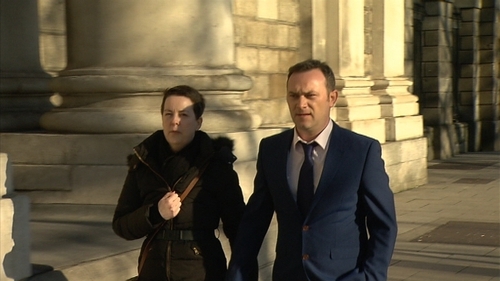 The HSE has admitted it owed a duty of care to Ms Morrissey, but not to her husband. The HSE earlier objected to the case being widened to include Ms Morrissey's claim that if she had known about the review earlier she would have had more scans and the recurrence of her cancer would have been diagnosed sooner. Mr Justice Kevin Cross ruled the case should proceed on the expanded basis. He said it had to go on and it would be grossly unfair if it did not. The case will continue tomorrow and is expected to take around six weeks.